Leading Manufacturer of metal bushes, industrial metal bushes and gunmetal bush from Rajkot. 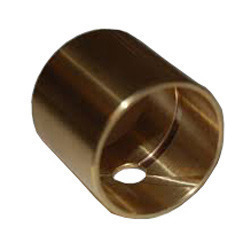 Our firm is dealing in the manufacturing and supplying of Metal Bushes. The offered industrial bushes are very reliable thrust bearing tools which can easily bear the pressure and torque of a moving rotor. Our offered industrial bushes are tough components which can provide adequate support for the rotor. 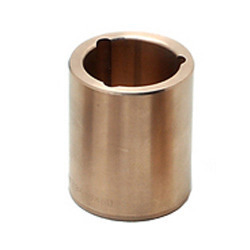 The offered industrial bushes are made from hard copper, zinc and tin alloy. Our offered industrial bushes are quite cost effective in rates. We are humbled to declare ourselves as the manufacturer and supplier of Industrial Metal Bushes. The offered industrial bushes are unique thrust bearing surfaces which are capable of bearing the heavy thrust and pressure of rotors. Our offered industrial bushes are versatile in the thrust bearing capacity. The offered industrial bushes are commonly used in all major industrial rotor applications. We are humbled to declare ourselves as the manufacturer and supplier of Self Lubricating Bushings. The offered gunmetal casting is a hard casting, made for the rotor applications. Our offered gunmetal casting is a hard composition of copper, zinc and tin. The offered gunmetal casting is widely used for the rotor applications, as a torque bearing surface. Our offered gunmetal casting is able to very efficiently bear the hard shear of rotor.